The paint on the case on this Henry J Green bourdon tube thermograph (Identified as No 252) is in poor shape, but the instrument actually works quite well, including the clock drive. The clock drive it came with may not be original, it was made by Lufft and is probably pre WWII as it indicates 'Made in Germany'. It is identified as a Richard's thermograph and is catalog #564 in the ca. 1915 Green catalog. It came with a 1072 chart with a range of 5 F to 100 F (confirmed by the Green catalog), but the chart was damaged. Belfort sells a 1072A chart, but it's not the same. It has the same temperature spacing but an increased range, it's a wider chart. If anyone has a clean 1072 chart, or a jpg image of one, please contact me. 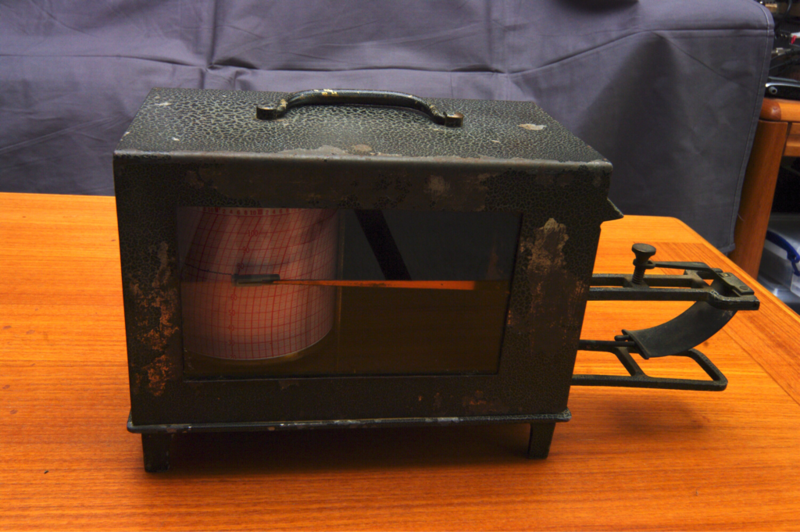 There is a 1923 US Army Signal Corps ML-18 thermograph in the Smithsonian that looks nearly identical except that the ML-18 has a temperature scale card mounted near the pen and the bourdon tube supports are very slightly different. It has the same temperature range. A Smithsonian report indicates that the ML-18 is a copy of Richard Freres thermograph made by Friez.